There is nothing simpler than throwing on a dress for an immediate pulled-together look. It's especially awesome when the dress is stylish AND comfortable. I shared on Wednesday a little bit about style with versatile dresses and promised to give you some examples today. 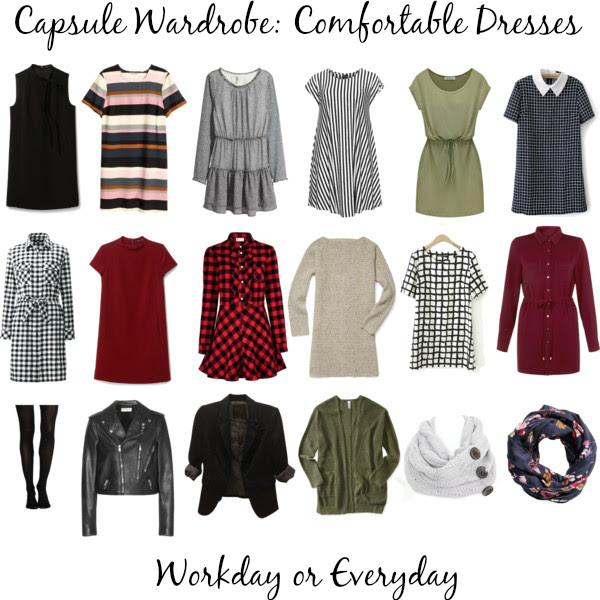 The capsule above is full of versatile dresses. They have beautiful lines, varying textures and most of all, comfort. ALL of these dresses exude a level of easy movement and classic simplicity. They can be dressed up with a suit jacket and necklace; or dressed down with a cardigan and scarf. I'll talk more about layering dresses with other clothing items in a future post. You want a dress to be as versatile as possible to increase your mixability within a capsule wardrobe. Are the dresses in your closet versatile and comfortable? Do you find yourself returning to them often or avoiding them? You have inspired me! It gets old trying to figure out what to wear. Putting together a capsule wardrobe seems like a great idea for me. Rebecca, that makes my day! I love that you're feeling inspired to try a capsule!